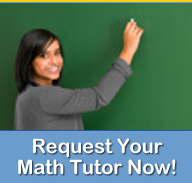 Math Tutoring Experts assists high school students in various mathematical classes from freshman to senior levels. Major classes such as Prealgebra, Algebra, Geometry, Algebra with Trigonometry, Precalculus, Statistics, and AP Calculus are the main subjects that MTE provides assistance in. Other subjects such as Business Calculus and Linear Algebra can also receive assistance upon request. Having a solid foundation in mathematics can prepare students for college, vocational school, employment, and overall success in whatever path they may choose to follow. Math Tutoring Experts can be a bridge towards that success. MTE provides assistance in courses primarily during the afternoon or evening hours when this time is most conducive to when students need outside professional instruction. MTE also provides assistance during the weekends for students primarily with topics such as Algebra and Geometry. To begin using MTE services, please refer to the Getting Started page. One of our representatives will be with you shortly. Parents, teachers, administrators, and students are all encouraged and welcomed to contact MTE about their math tutoring needs for their particular school or student. Let Math Tutoring Experts help assist your high school or high school student to become successful with their mathematics classes. Let MTE be your trusted resource!